The oculomotor nerve is the third cranial nerve (CN III). It provides motor and parasympathetic innervation to some of the structures within the bony orbit. In this article we shall look at the anatomy of the oculomotor nerve – its anatomical course, functions and clinical correlations. Motor – Innervates the majority of the extraocular muscles (levator palpebrae superioris, superior rectus, inferior rectus, medial rectus and inferior oblique). Parasympathetic – Supplies the sphincter pupillae and the ciliary muscles of the eye. Sympathetic – No direct function, but sympathetic fibres run with the oculomotor nerve to innervate the superior tarsal muscle (helps to raise the eyelid). 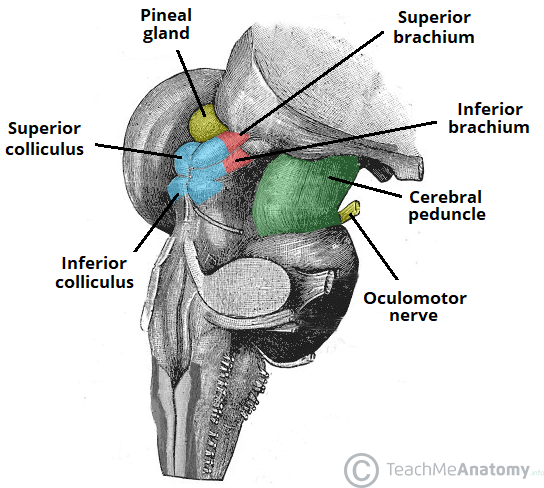 The oculomotor nerve originates from the oculomotor nucleus – located within the midbrain of the brainstem, ventral to the cerebral aqueduct. It emerges from the anterior aspect of the midbrain, passing inferiorly to the posterior cerebral artery and superiorly to the superior cerebellar artery. The nerve then pierces the dura mater and enters the lateral aspect of the cavernous sinus. Within the cavernous sinus, it receives sympathetic branches from the internal carotid plexus. These fibres do not combine with the oculomotor nerve – they merely travel within its sheath. Superior branch – provides motor innervation to the superior rectus and levator palpabrae superioris. Sympathetic fibres run with the superior branch to innervate the superior tarsal muscle. 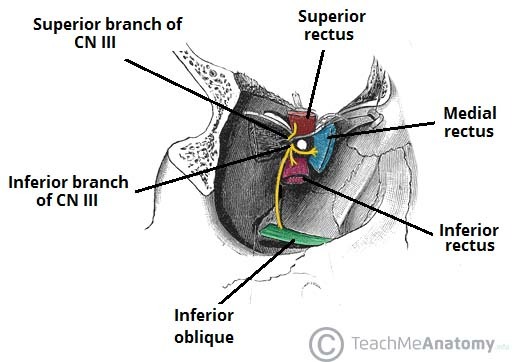 Inferior branch – provides motor innervation to the inferior rectus, medial rectus and inferior oblique. Also supplies pre-ganglionic parasympathetic fibres to the ciliary ganglion, which ultimately innervates the sphincter pupillae and ciliary muscles. Fig 2 – The superior and inferior branches of the oculomotor nerve within the bony orbit. The oculomotor nerve innervates many of the extraocular muscles. These muscles move the eyeball and upper eyelid. Levator palpabrae superioris – raises the upper eyelid. Additionally, there are sympathetic fibres that travel with the superior branch of the oculomotor nerve. They innervate the superior tarsal muscle, which acts to keep the eyelid elevated after the levator palpabrae superioris has raised it. Fig 3 – Lateral view of the extraocular muscles. Sphincter pupillae – constricts the pupil, reducing the amount of light entering the eye. Ciliary muscles – contracts, causes the lens to become more spherical, and thus more adapted to short range vision. The pre-ganglionic parasympathetic fibres travel in the inferior branch of the oculomotor nerve. Within the orbit, they branch off and synapse in the ciliary ganglion. The post-ganglionic fibres are carried to the eye via the short ciliary nerves. Fig 4 – Overview of the oculomotor nerve branches. The parasympathetic fibres have been highlighted in green. Raised intracranial pressure (compresses the nerve against the temporal bone). Cavernous sinus infection or trauma. 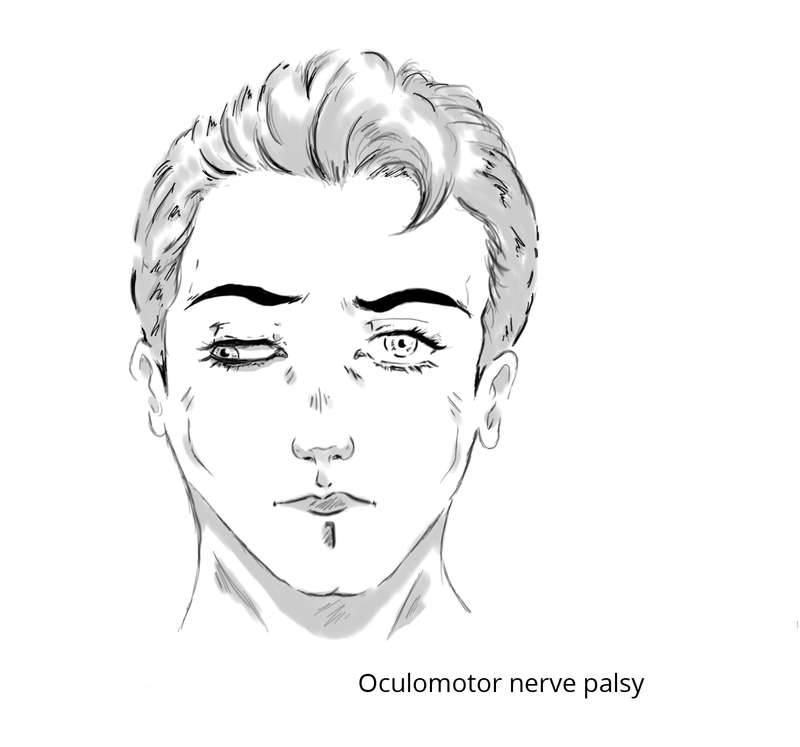 Note: there are other pathological causes of oculomotor nerve palsy such as diabetes, multiple sclerosis, myasthenia gravis and giant cell arteritis. Ptosis (drooping upper eyelid) – due to paralysis of the levator palpabrae superioris and unopposed activity of the orbicularis oculi muscle. ‘Down and out‘ position of the eye at rest – due to paralysis of the superior, inferior and medial rectus, and the inferior oblique (and therefore the unopposed activity of the lateral rectus and superior oblique). The patient is unable to elevate, depress or adduct the eye. Dilated pupil – due to the unopposed action of the dilator pupillae muscle. Which of these muscles is NOT innervated by the oculomotor nerve? The fibres from the internal carotid plexus are of which type? The oculomotor nerve exits the cranium through which structure?